XCore Project reviews, ideas, videos and proposals. 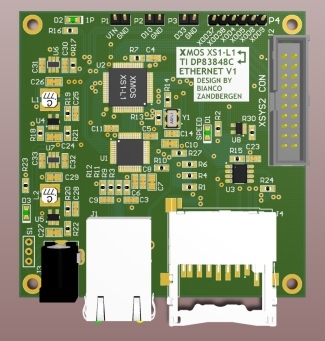 This is a prototype board for the Texas Instruments (Formerly National Semiconductor) DP83848C Ethernet PHY. 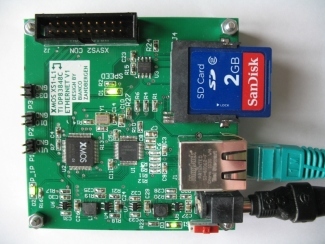 The main advantage of this PHY over the SMSC LANx products used in XMOS reference designs is that it is also available in an easy to solder LQFP-48 package. The download contains the schematics, detailed BOM, PCB design, Gerber files, XN file and demo .xe file. It is likely that the TI TLK110 PHY can also be used on this design, they are pin compatible I believe, but I have yet to confirm it. i have seen you schematic. All is a very good work. I have to make a schematic for my own work. What software do you use? I use Altium Designer for schematics and PCB design. -or other (got free software or else). Please sir can you send me the SchDoc file and PcbFile of your project ? (if you used some special libraries I would like to have them too). 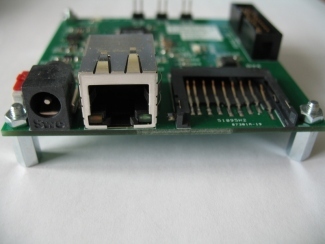 Hi Bianco, I'd like to test Ethernet based on your design with DP83848C. I have a problem with finding out which GiHub branch to use for sc_ethernet (currently dozen of different branches exists in that repository).